So today I am posting a widget which I personally like too much. This widget is somewhat like the previous Featured Post widget I have posted but totally different in functioning. You can add this slider to your Sidebar. You just have to do 1 time customization unlike the previous widget. It is fully automated you just have to enter your blogs URL and the slider will keep updating the posts. This widget is somewhat different. We normally use Sidebar for adding widgets like Popular Posts, Labels, Like box etc. but this time we would be adding a slider to the sidebar. This widget contains number of effects including Hover effect, Transition effect etc. You can change the number of slides to be shown. You can change the posts displayed for a specific label i.e. if you want to show only of a specific label you can by changing the settings. To see the live demo of this widget click the button below and look at the right sidebar. Now save the template so that changes can take place. These are the 1 time settings you may apply. autoplay = Write true or false in you want / don't want the slides to change automatically. tagname = If you want to display articles by tag / label, such as the tag widget, it will be written as tagname: "widget"
Once you are done with the settings edit the code and Save the template again. 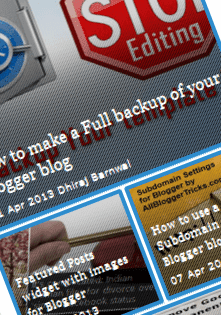 Thats it, a cool sidebar slider can now be seen in your blogger blog. @Tiffany The problem is that the widget only crawl images which are uploaded i.e. images which have .blogspot in the domain. Images from tinypic, photobucket etc. can't be crawled by this widget. For changing the color of the border search for "border: 4px solid #2E8DCE;" and Replace #2E8DCE with your desired color. Great widget. Is it possible to remove the 4th box at the bottom? thanks. @Brandoh As you can see the boxes HTML is added in the JS file itself so you have to edit the JS file in order to remove the bottom box. In short you can't if you can not host your own JS file somewhere else. this slider makes the header slider of the blog stop working. any idea why and if this can be fixed? @Kobi Can I get the URL of your blog please. This is not fully you lier..
Automatic is reffered in terms of working. Well in other sliders you have to manually add images, links and update them timely but here once you have put your URL it will work automatically. This is really helpful , but i have a bit problem .. How to change the font style and size ? Hi Xiao search for [pre] ul.abt-sidebar-slider h4[pre] and see the css properties inside the bracket and edit them. @Naveen As far as I think the problem may be in the image server i.e. where the image is hosted. Blogger crawl images from some sites only like for example 1.bp.blogspot.com etc. The best way to overcome this problem is to "upload" images rather than copying and pasting them. Well as of now No. We will work on it. Thanks for suggesting though. Hope see it soon.keep up the good job,many thanks,greetings from Greece-Athens ! I dont know to make it display the recent post from a special category :/ Can you please help me ? My blog is on blogger. Thank you in advance, its a wonderful plugin! As of now No. But I will surely look after this. i dont want the author name been seen in public in this widget. is there anyway my friend? I have this widget installed in my website. If I want to change the description font of the slider from Times Roman to Arial then how will I do it. Acutually, I use Arial font for my blog so I want Arial font on my description of the slider post when it changes. Please help me with this asap. Its happening because you do not upload the images. Blogger crawl images from their own hosted servers and some other selected servers. To fix this you may download and "upload" the image in the posts. Thanks a lot for solving my problem with the Times Roman font. I have now changed with the Arial font. But now I want to change Label color in solid black color so that the Text on the Slider label will be visible. I don't want the slider label color with light black shade which originally appears. I want to change the Label color into solid black so that my Label Text which is in white color will become visible. I hope you got my point. Please help me with this asap. For that add this code too. Hi where precisely I need to add this code? this is superb. thank you for your generosity. when i put this widget to my blog, the top slide show stop to slide, can i help me for this problem? Thank You Very much..Do you know css? I just want to change something in my menu..
How do I change the border of the tiles to black? Thanks. Thanks alot for sharing this helpful post. sidebar slider attract your blog and gives an eye catching look to your page. Your just give a great information. Sir, Hats off for this awesome post. I have tried so many ideas to make my blog popular but no one of these work. Visit my blog and please tell me what is wrong..
Nice Widget. I want to show post from multiple labels. Is there a way to do it ? thanks for share color code. i use this color code in my blog. why you always insert "abt" on CSS ? Haha ! I am really sorry if that caused you inconvenience. My main motive for adding abt is to avoid other noob copy cats to replicate my codes and show others that the following thing/widget was coded by them and it has been very helpful for me too. There are more than 50 blogs which have copied my posts word to word (Yah I don't impose DMCA on them because I am tooooooo lazy :P ) The codes help other people who browser the copiers blog to know that it was coded by abt. so, it mean this widget made by you, am i right ? How do i change the border's color? btw. i love this widget. Thanks for this awesome auto slider. I use this for my blog and it suits very well in my current theme. Keep up the good work! Dhiraj Barnwal thank you very very much. Is it possible to show random posts? Hello! Thanks for the widget. I have 3 blogs with this widget.... and I have a problem in 1 of them..... I don´t know why, in this blog http://youtubi-fun.blogspot.com I can´t make it work like in the others. The images and the titles are with wrong format. Why not work with label? I put a link up to the label and put tagname "widget" but does not work. Where is the mistake? Blogger has changed their image upload servers, so even if you directly upload the images in the post, it still won't show on the slider anymore. It is no longer bp.blogger something, it is now google usercontent etc. Actually I just realized that if I use my uploaded picture in "original size," it changes the URL and no longer shows/crawls the image into the sidebar, but if I use any other sizes and customize the size HTML, then it will be shown in the sidebar. Strange. Hi Dhiraj, It is an amazing work by you. Can you guide what more I can do specifically for my home page. This is almost perfect, how to make it shows a little bit of the post text too? I mean 100 o 200 characters of the posts (or a few more in the main tab), thanks in advanced for the hard-work !! Hi dhiraj dear i want to make those boxes fully transparent and text color into black ! i would love if you could help me ! now my featured slide post wont work with this on the sidebar? It worked for my site for a little while. But doesn't seem to be working anymore. Hi. It worked for me. But I changed settings to hide the gadget in pages other than the home page. Now, I can't see it on display. Widget has stop working correct last 24 hours, images (blogspot loaded images) does not appear. what widget do you use now on your site? yes, there is a way for that, dear. if you need to add more than one label, you can create another label then added to posts of above labels. For example, you want to show posts under label (category) "sport", "headline", and "business" in homepage slider, so you can create a new label "feature", add this label to posts under three labels "sport", "headline", "business". After that, add to slider one label “feature” only. It works. Amazing look. But when I click a post in it, the post open a new window, instead of the same window. Can U change the code to stay at the old window. में जनता हु कि आप बेस्ट है पर ये मेरे लिए काम नहीं किया .. you can learn hindi with me .. visit..